Learn How to Get Our Updated Video Bar Review Course for Free! PRG always keeps our classroom Bar Review Course and our online video Bar Review Course current and up-to-date! The latest version of our video course is being released on December 1, 2012. This video course reflects all the latest changes to the law and to the USPTO registration exam. The USPTO announced this week that they will be updating the content of the registration exam in early April 2013 to reflect the provisions of the America Invents Act (AIA) that will take effect on March 16, 2013. Why not prepare now and take the exam before it changes in April? Need some additional incentive? If you sign up for our January 21-25, 2013 classroom course in Pasadena, CA, we will give you the video course for FREE! This is an $820 value, so don’t pass up this chance to supplement your classroom work with our video course at no cost to you. The online video course gives you the ability to go back and review any portions of the course where you need some extra help and guidance, proceeding at your own pace. PRG Patent Bar Review in Pasadena, CA in January 2013! Free access to ExamWare®, our highly-acclaimed patent exam preparation software which is now available online. This Classroom Course is being held at the Hilton Pasadena, a well-appointed and centrally located hotel, in walking distance to Old Town Pasadena and the Paseo Colorado, featuring numerous shopping, dining, and entertainment options. The hotel offers complimentary WiFi throughout; a 24-hour Fitness Center; lobby-level Starbucks; an onsite restaurant and bar; and an outdoor heated pool. The rate available to attendees is $127.00 per night, single or double, plus tax. The hotel reservation cut-off date is Monday, January 7, 2013, so plan ahead and make reservations soon to attend the PRG Patent Bar Review in Pasadena! Learn more about the PRG Patent Bar Review Course and register online. 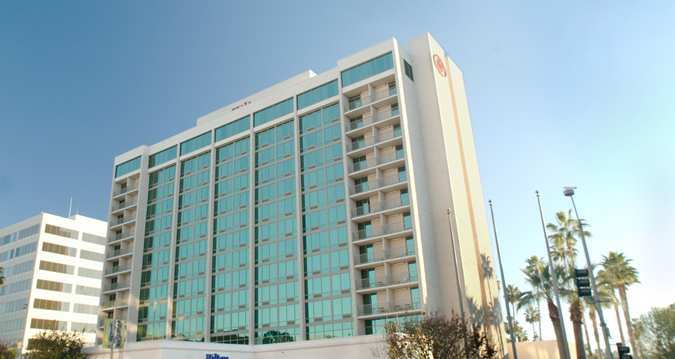 Learn more about the Hilton Pasadena. Simulated Exam Mode. Questions are randomly selected from either the entire database (according to frequency of subjects on past exams) or selected chapters of Patent Practice. The exam is timed, and the grade is posted immediately upon completion. When using the simulated exam mode, shorter questions may be excluded to increase difficulty. Question and Answer Study Mode. Questions are asked either sequentially or randomly (from any one or more chapters you select in Patent Practice) with instant feedback including the correct answer, explanation, or legal authority where applicable. Missed Question Mode. Learn from your mistakes. Review questions from the entire database or from selected chapters that you previously answered incorrectly. Performance History. Results are maintained for both the Simulated Exam and Question and Answer Study Modes, in bar graph and table form. View accuracy and time analyses in aggregate or by chapter of the Patent Practice treatise. Performance history of your study sessions is automatically stored. Optimum Viewing Choices. Click on the best font size option and resize the screen to your preference. Choose multiple windows to simultaneously display questions and answers. Online Legal Authorities. Browse pertinent sections of the statute, rules, MPEP, and PCT while working on questions or reviewing answer text. All legal authorities have been completely updated. Visit the PRG website to learn more about ExamWare®, the Classroom Patent Bar Review Course, or the Video Course. Matt Rodgers (Managing Director, Europe, Landon IP LTD) is teaching “The Art and Science of Patent Searching” this week at a Management Forum event in London. The course is taking place from November 14-16 in the Harrington Hall Hotel and covers many issues relating to patentability, validity, and infringement searching. Mr. Rodgers is a seasoned lecturer on the topic, relying on his many years of patent searching expertise to inform attendees of the rigorous and detailed work involved in the multi-step process. “The Art and Science of Patent Searching” course is based on an offering Mr. Rodgers has taught many times, by Patent Resources Group, a leading provider of patent-centric continuing legal education. PRG’s January 2013 Bar Review Course Now Open for Registration! Are you making plans to take the USPTO patent bar exam early in 2013, before the test changes again? PRG is ready for you! Sign up today for our next Patent Bar Review classroom course, which is being offered in Pasadena, California at the Hilton Pasadena from January 21-25, 2013. Why should you take PRG’s Bar Review Course? We always keep our classroom course and our video course current — both have already been updated to reflect the changes to the exam that were rolled out on October 2, 2012. We leverage use of the web to improve your experience. Both ExamWare® — our exam preparation software — and our video course are available online and are accessible from your browser on any PC or Mac. We offer the best possible training and course content, covering all topics that could be included on your exam. You get 37.5 hours of actual instruction time and detailed course presentation slides to facilitate note-taking and studying. We provide a comprehensive exam preparation program that includes the course itself, FREE access to ExamWare®, detailed study plans and calendars, and access to our “Passing the Patent Bar with PRG” blog. ExamWare®, PRG’s exclusive online exam preparation software, greatly enhances your chances of passing the USPTO Registration Examination by providing a simulated exam environment with an assortment of questions, answers, feedback, and links to the patent statute, patent rules and the USPTO Manual of Patent Examining Procedure (MPEP). ExamWare® is an invaluable tool for providing “real-life” preparation for the exam. The academic staff of Patent Resources Group regularly reviews and updates all of the Patent Office’s published questions and model answers, as well as the explanations or authorities establishing why each multiple-choice answer is right or wrong. Since its introduction, ExamWare® has been used by thousands of patent professionals at leading patent law firms, companies, and universities to successfully prepare for the Registration Examination for Patent Attorneys and Agents. The software includes approximately two thousand practice questions, with explanations and hyperlinks to legal authorities including Title 37 of the Code of Federal Regulations, Title 35 of the United States Code, the MPEP, and the Patent Cooperation Treaty (PCT). In 2011, we introduced ExamWare® online, which offers users added flexibility as it can be accessed from any computer at any time with your user e-mail and password. Questions are available in multiple study modes, including simulated USPTO exams, and can be selected by topic or at random. Users can choose to receive instant feedback on answers, as well as view a detailed graphical scoring analysis for each study session. You must sign up for either the Classroom or Video Patent Bar Review course to receive access to our online ExamWare®. Access to this invaluable Exam tool is not available outside of Classroom or Video course purchase. Learn more about the Classroom or Online Video Patent Bar Review Course.